Our ninth day on safari had us driving in the Serengeti National Park once again. On this day, we got up close and personal with a group of African Buffalo. We were all zooming in tight and taking photos of these animals, but the real goal was to get some photos of the buffalo with the ox peckers on their faces. Most of the people who were on this year's safari remembered my photo from the previous safari, with the bird right on the nose of the buffalo. And they really wanted a similar shot. Knowing that the ox peckers use the buffalo as their own personal ecosystem, I figured that we would have this opportunity. But for the first 8 days of safari, we had yet to get a good shot of this. Day 9 changed that. As the ox peckers moved around the buffalo, we would keep shooting, to get different angles of the two animals in harmony. We were driving along when I saw these two baboons up on a dead tree limb. What I loved about this moment, was the fact that they were watching the migration, just as we were. I zoomed out to 300mm to show a lot of the scene and set the aperture at f/8. This narrower aperture was to put the focus on the baboons (my subjects) but still have you be able to see the tree and wildebeest in the background. We saw more baboons with babies. We did come across a leopard up in a tree. This is not a great photo, but I wanted to include this photo so that you could see what we were seeing. Part of being on a safari is the game of chance. You just never know what you are going to see on each trip. On our last safari, we only saw leopards about 300 yards away and it wasn't even a shot. This was a better photo opportunity than the year before, but still not great. Thank goodness we were lucky enough to see leopards up close in the previous days. We did see a pride of lion but they were not very active. It is a little funny, but after seeing as many lions as we had, we decided that we would move on. How often can you say that you are done seeing lions in the wild? I did take this one tight shot of the male. Unlike the previous year, which was much wetter and greener, we saw many dust devils in the plains. As you can see, we had really great weather on the trip, including blue skies and nice puffy clouds. We stayed out on safari until 5:30pm, and then started making our way back to the tent lodge for some downloading, rest and dinner. 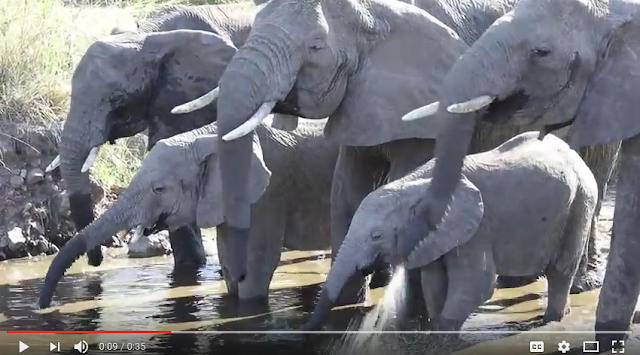 We were on the road back to the lodge, maybe a couple of hundred yards from where we were staying, when we saw this herd of elephants drinking from a nearby water hole. It was awesome! Look at all these elephants right in front of us! And they had babies too. I was shooting with the Canon 200-400mm lens, but zoomed all the way back to 200mm. That is how close we were to the animals. We looked over and spotted this baby nursing. It was incredible to watch this. And once again, I shot a short video to share the experience with you all. You need to watch this one! Stay tuned for our 10th day on safari. It was our last full day doing a game drive, but it was an amazing one.